. . . [on this new recording of "The Lark Ascending", Zukerman's] "silver chain of sound" remains delicate but stronger in the violinist's mature interpretation. The early shift is done with ecstatic, weightless clarity, and the flock is never allowed to overpower the bird thereafter. Zukerman clearly has a natural affinity for its essential Englishness, something that also comes through in the "Fantasia on a Theme by Thomas Tallis" . . .
. . . [it's been 40 years since he tackled Vaughan William's " The Lark Ascending", yet] Zukerman still phrases the music with affection. The tracklisting reads like a compilation of everyone's favourite bits of English string music . . . Zukerman's "Tallis Fantasia" exudes exactly the right degree of rapt mystery, the strings of the underrated Royal Philharmonic Orchestra on fine form. We get a sweetly-paced account of Elgar's Serenade and an electrifying "Introduction and Allegro", the work's faster music brilliantly incisive. "Chanson de matin" and "Chanson de nuit" may be salon pieces, but they're deeply affecting when performed this well. All warmly recorded in the mellow acoustic of Cadogan Hall. An unexpected delight of a disc -- you may possess umpteen versions of these pieces already, but Zukerman's intelligence and affection make this worthy of a place on anyone's shelf.
. . . Zukerman's fabulous timbre remains a marvel, captured of course in more modem sound . . . there's welcome warmth and naturalness in the music-making of a partnership previously undocumented on disc. The selection is generous too, with an interlude of old-school favourites . . . [in Tallis's "Fantasia",] when the Introduction and Allegro's resonant final cadence gives way to that throwaway pizzicato, Zukerman's more sonically focused players are at least helpfully unanimous. Their easeful affability has an eloquence of its own. Pinchas Zukerman's violin playing has lost nothing of its masterful immensity, gorgeousness of tone, and likeable directness of manner . . . to hear those qualities at work in "The Lark Ascending" is a memorable experience . . . entirely as striking, is the success with which those same qualities transfer to his conducting. There's no trace of portentousness in Zukerman's approach to the vast musical spaces searched out by the "Tallis Fantasia"; yet this seemingly no-nonsense interpretation has a strongly characterised, tight-reined majesty . . . the focused grandeur of tone generated by the RPO strings is more than powerful enough . . . [these are all] beautifully delivered, mannerism-free interpretations, with quality playing to match.
. . . [Vaughan Williams / "The Lark Ascending"]: this excellent violinist has the expressional heart of this wonderful piece, playing with unquestionable fluency, and his flights of fancy are nicely soaring . . . Zukerman conducts a splendid account of the Tallis Fantasia, richly sounded and expansively phrased . . . Elgar's Serenade is nicely done, urbane in the outer movements and spaciously eloquent in the central one. The disc closes with his Introduction and Allegro, a bracing and responsive reading . . . In between Zukerman returns to his violin to dominate "Salut d'amour", albeit in a stylish, "schmaltz"-free rendition . . . The two Chansons are tenderly realised . . . the music-making is impressive . . . Returning to "The Lark Ascending" for the first time in over 40 years, his sound is shining . . . the flute-led central folk-like melody paints an absorbing idealised picture of a wholesome pastoral idyll. In the Tallis Fantasia, the muted choir of strings sounds wonderfully coloured . . . the Introduction and Allegro benefits from colouring and pacing that take us to a more distinctly Elgarian sound world. This is a handsomely recorded release . . .
Is there anything Pinchas Zukerman can't play well? . . . Zukerman has a real affinity for this music and with the RPO in top form, some of these performances could hardly be surpassed. Elgar's wonderful Introduction and Allegro Op. 47, one of the greatest pieces in the repertoire for string orchestra, has rarely been played with this degree of virtuosity, beauty of tone, and clarity of texture . . . [Elgar / "Chanson de matin"]: Zukerman and the RPO give it an affectionate performance. Also included is part of the slow middle section ("In Moonlight") from Elgar's concert overture "In the South". Zukerman plays the melancholy viola solo with an ideal fullness of expression. Vaughan Williams' "The Lark Ascending" is a gorgeously evocative piece for violin and orchestra, and Zukerman does it proud . . . The "Fantasia on a Theme by Thomas Tallis" is another stellar performance. Vaughan Williams cleverly uses two string orchestras and a string quartet to provide variety in the string sonorities, and with a master string player like Zukerman on the podium, the composer's vision could hardly be in better hands. This is great string playing. Recording producer Philip Traugott and his team deserve enormous credit for the rich sound they captured from Zukerman and the RPO . . .
. . . the "Tallis Fantasia" is really impressive . 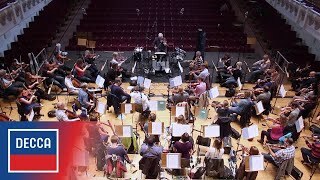 . .
Mit dem Royal Philharmonic Orchestra präsentiert Pinchas Zukerman mit edlem Geigen- (und Bratschen-)Ton zwei wichtige Richard-Strauss-Zeitgenossen . . .